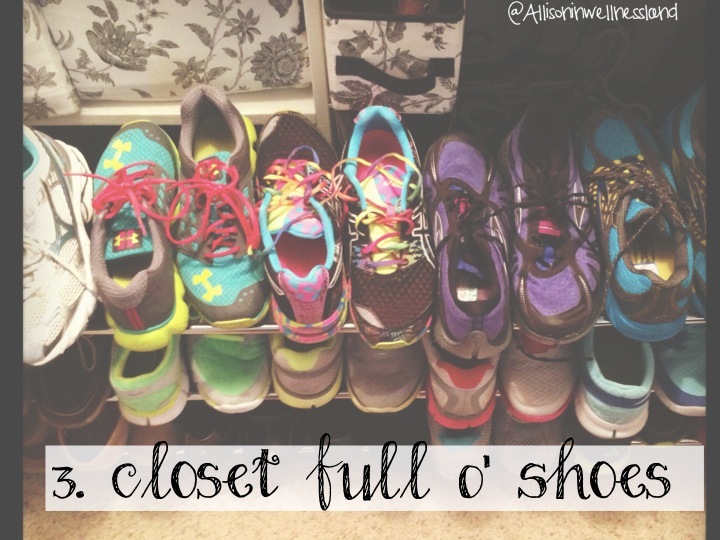 So I am popping in today for a quick pin it party extravaganza! 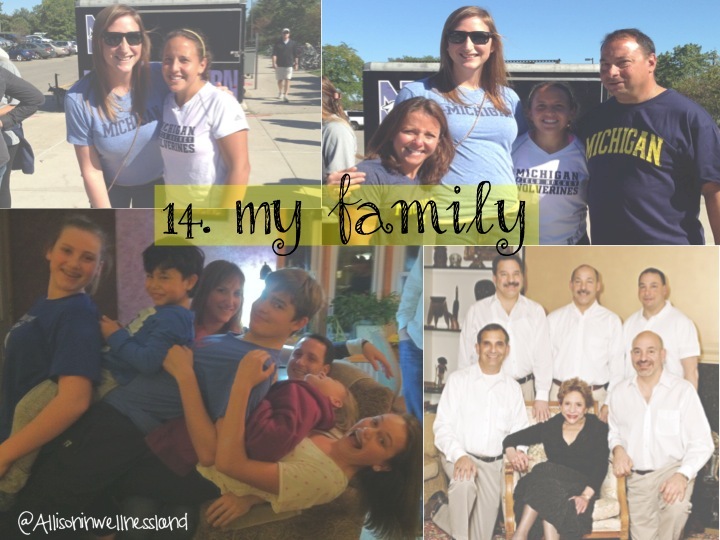 I hope you enjoy going back at some of my favorite posts as of late! Flax Power Scones – have you tried them yet?? they are amazing! Flaxseed Energy Balls – okay I might have a flax recipe obsession! Spinach Stuffed Chicken – a non-flax but equally delicious meal! The Science of Muscle Soreness – some fitness myth busting & nerding to help you! The Female Athlete Triad – get your nerd-on… okay I am a fitness nerd but this is good stuff guys, and important! Make sure you head over to The Lean Green Bean and check out the rest of the pin it party going on. You definitely don’t want to miss out on all the fun! I am beyond excited for the long weekend even though I am sure it will go by too fast! 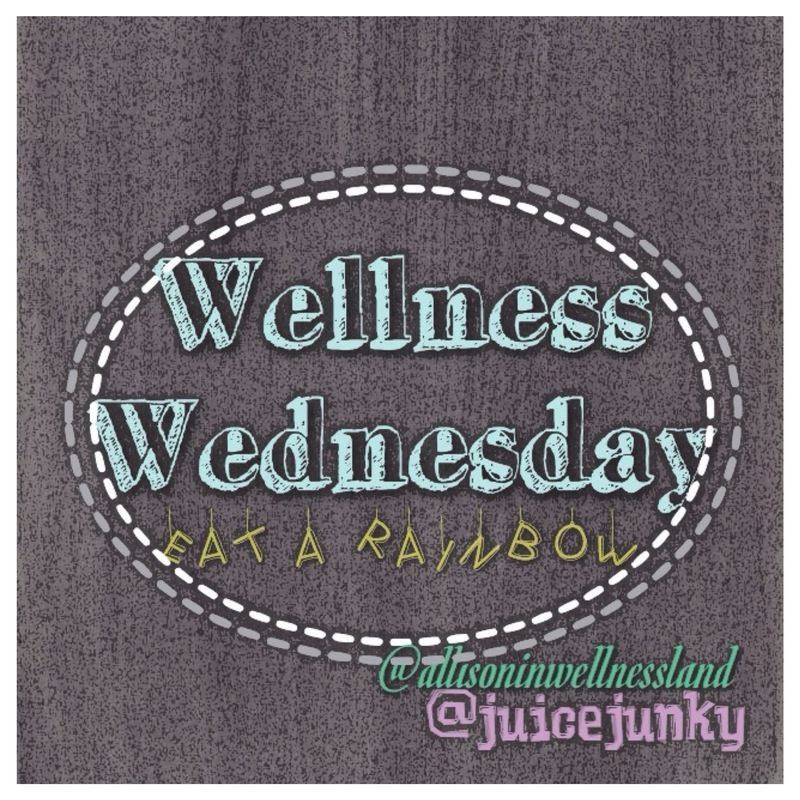 This week has gone by rather quickly, so far… I am loving the lighter days and brighter mornings. I feel like I am a better employee when I look outside and see bright sun shining rather than gloomy snow and grey skies. I know that we are not out of the woods yet, the Midwest is known for wintery-mixes thrown in here & there to put a major kink in a girls plans. 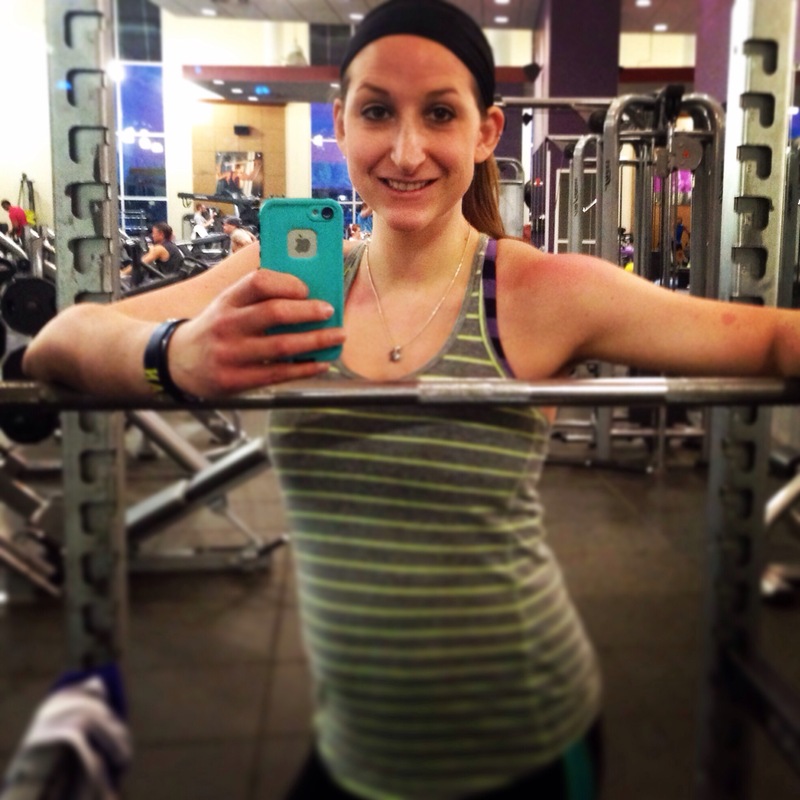 Yesterday’s GPP workout was front squats! I used to hate front squats and not see the point of them, but since GPP intensive I have learned to love them a bit more! I still have trouble cleaning a heavy bar from the ground to my chest and didn’t want to burn out on my workout from doing a ton of cleans, so I cheated improvised & used the squat rack. This way I was able to walk right up to the bar and seat it solidly on my shoulders without burning out before a squat even happened. The goal (Rx) for the workout was 5 sets of 10 reps. I did my first three sets Rx’d but then when I upped my weight to 155# I was only able to perform 7 reps before form break down. I did this for set 4 & 5, I was close to getting an 8th rep in set 5 but that just didn’t happen today. You know its front squat day when your “rack” is red! I have mentioned before that I gave up meat for lent and this week I decided that I was sorta sick of just a salad at lunch. 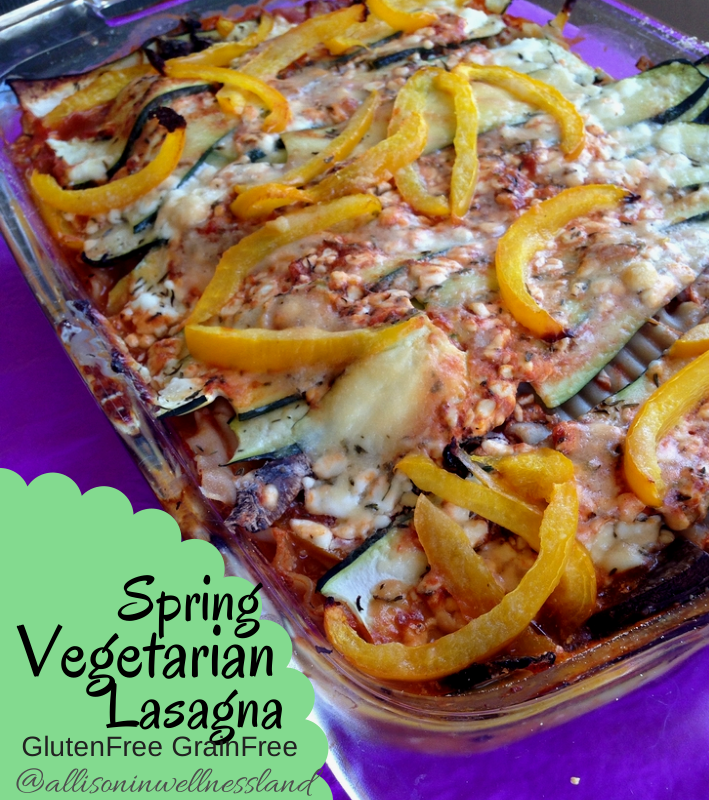 I decided to try my hand at a vegetarian lasagna packed with all my favorite spring flavors. maybe if I think enough spring things it will come and stay! 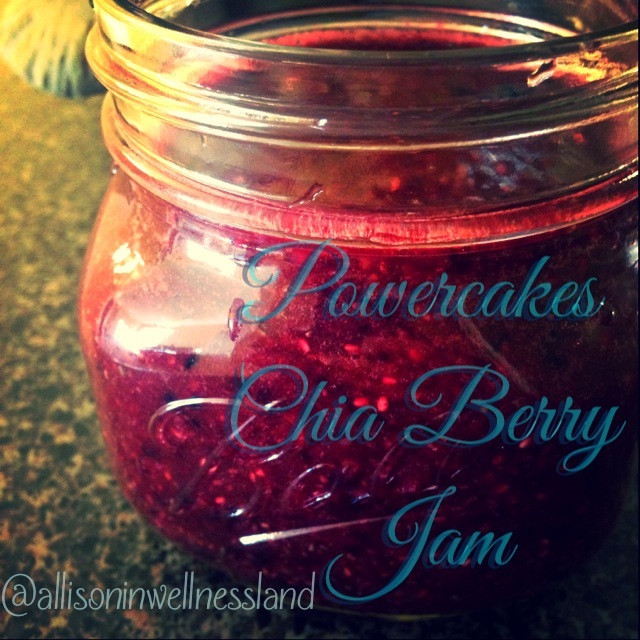 I used this He & She Eat Clean recipe as a very loose guideline for the creation of this dish. 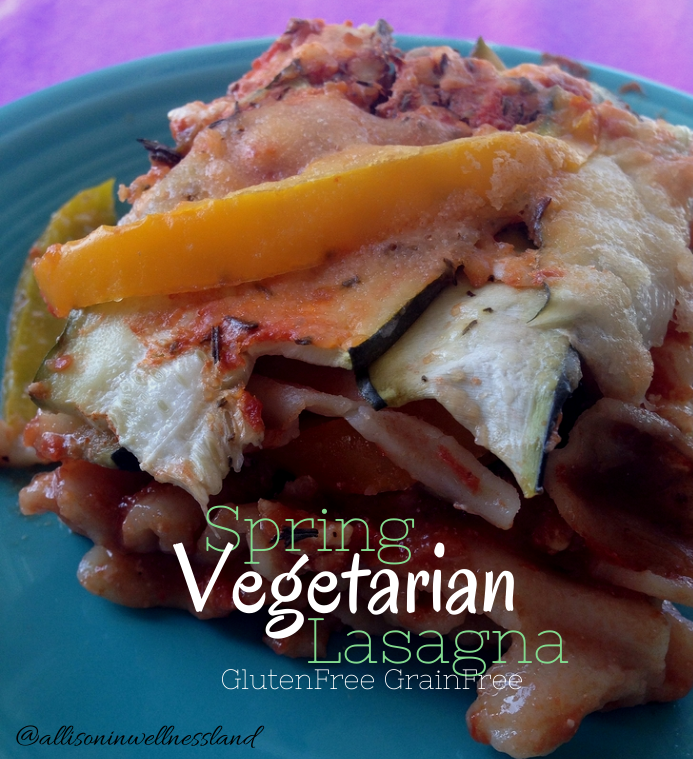 I had a package of these Hodgson Mills gluten-free Brown Rice Lasagna noodles in my pantry that were calling my name! At the store I picked up a jar of organic pasta sauce, a few small zucchinis, bell pepper and some mushrooms. But you could easily use whatever veggies you love and wanted in this. When the noodles were cooking, undercook them a little so they are not mushy after baking, I chopped and prepped all the vegetables. I used the thin slice side of my mandolin to thinly slice the zucchini. I ended up using 2 small zucchinis in this recipe. 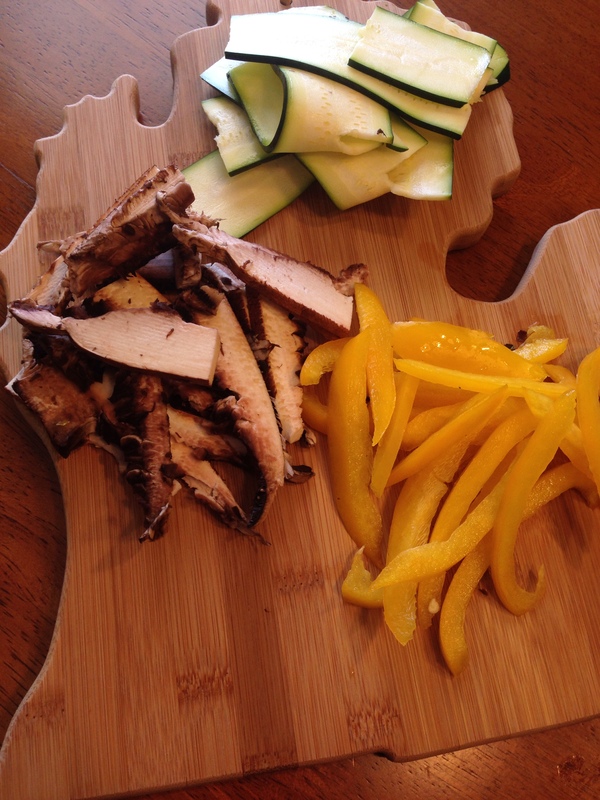 I sliced two BIG portobello caps into thin strips that I then halved. Lastly I sliced two yellow bell peppers into thin strips. Set aside for later. When the pasta was done I transferred it immediately to a colander and ran cold water over them to stop the cooking process. Set aside for later. Next take 12-14oz of 2% cottage cheese and put in a bowl, I used the remaining portion of the cottage cheese and the cottage cheese tub #lessdishesforme. Mix into cottage cheese thyme, oregano, garlic powder (or 1 clove finely diced garlic), black pepper and a pinch of salt. In a casserole dish add approximately 1/4-1/3cup of tomato sauce and 1/4cup of cottage cheese mixture on the bottom of the pan. Next add a layer of lasagna noodles & 1/3rd zucchini “noodles”, add another 1/4-1/3cup of sauce spread evenly, add 1/3rd of mushrooms & bell peppers, top with 1/3rd of remaining cottage cheese mixture. Continue layering noodles, zucchini, sauce, veggies & cottage cheese until all noodles and veggies have been used. I topped the whole thing with a bit of parmesan cheese and black pepper. Cover with tin foil and bake at 350degrees for 60 minutes. Remove foil & cook for another 15-20minutes. Remove from oven and let stand 10-15minutes before serving. I have had this the past two days for lunch and it is light but hearty. It is not very cheesy so if you are a cheese lover feel free to add some mozzarella on top or between each layer. I think this would also be great with spinach in each layer! I hope you enjoy and have a wonderful Wednesday! Do you like to do front squats? What would you put in your spring casserole? 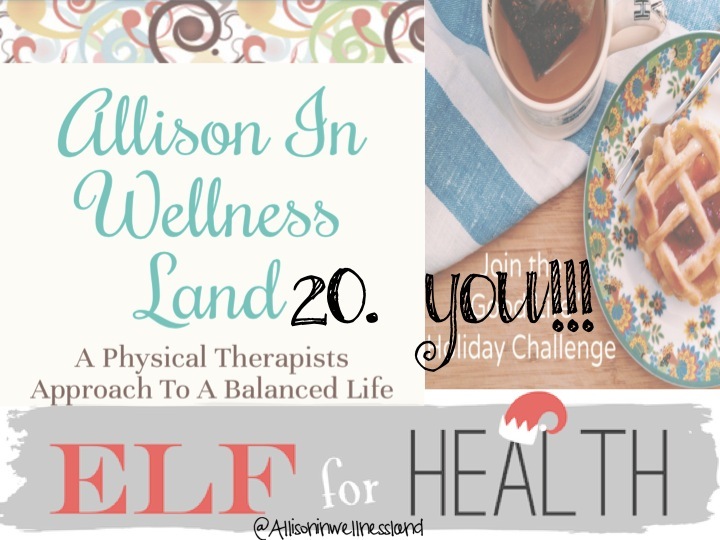 Yesterday’s Elf 4 Health challenge was to write 20 things you’re grateful for in a Gratitude list. It may have taken me some extra time to compile but with some time and thought I developed Twenty things in 2013 that I am grateful for. This list was compiled in absolutely NO particular order. 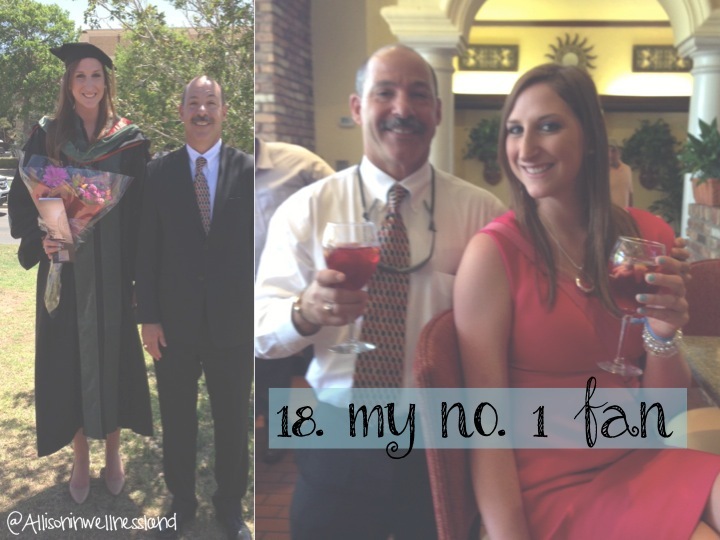 Just a list of things I am grateful for, provided to you in wonderful pictures of the last 11 months! 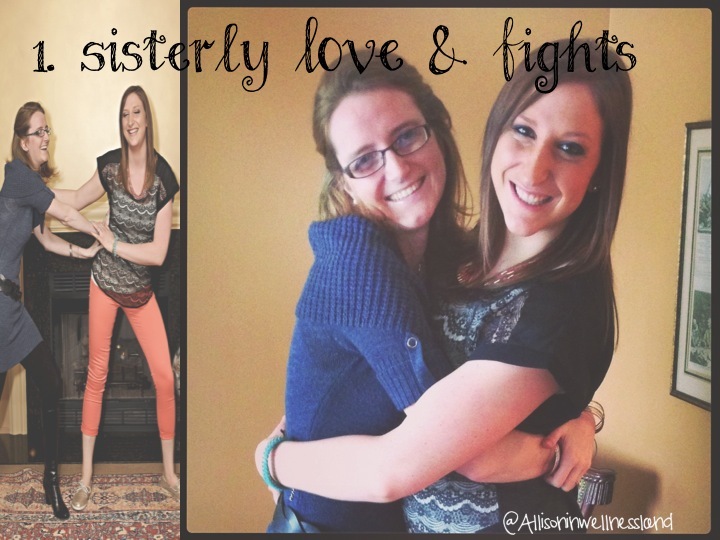 My Sister is one of a kind… I am grateful to have her compassionate, carefree, wine drinking self in my life! We may not be the closet but we are the coolest. 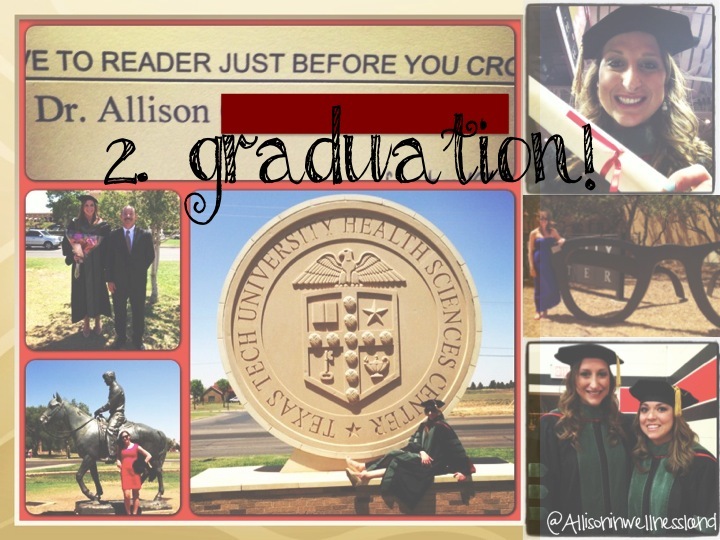 I never thought the day would come & then I got TWO DAYS… Graduation from TTU was definitely a highlight of this year. Dearest high school friend got hitches in a gorgeous garden wedding! I felt beyond blessed to be a part of her day and celebrate their love! I can’t believe its almost 6 months already! 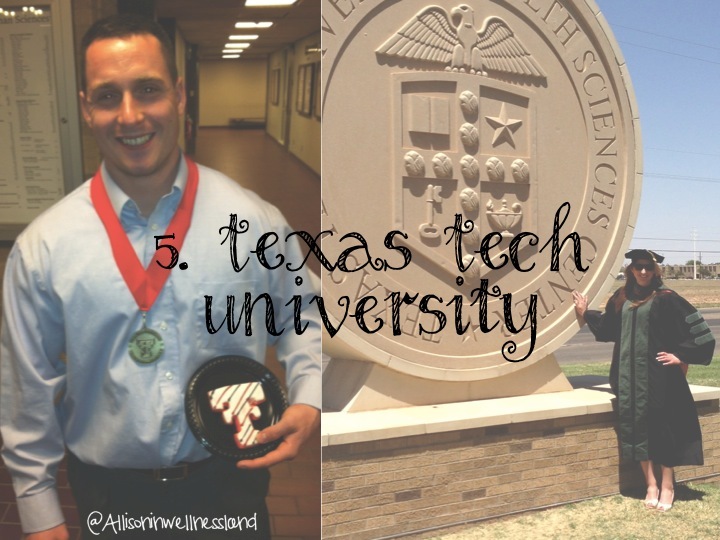 For without Texas Tech, I would have never met this guy… he keeps me sane, loves me, spoils me, and pushes me to be the best ME I can be! 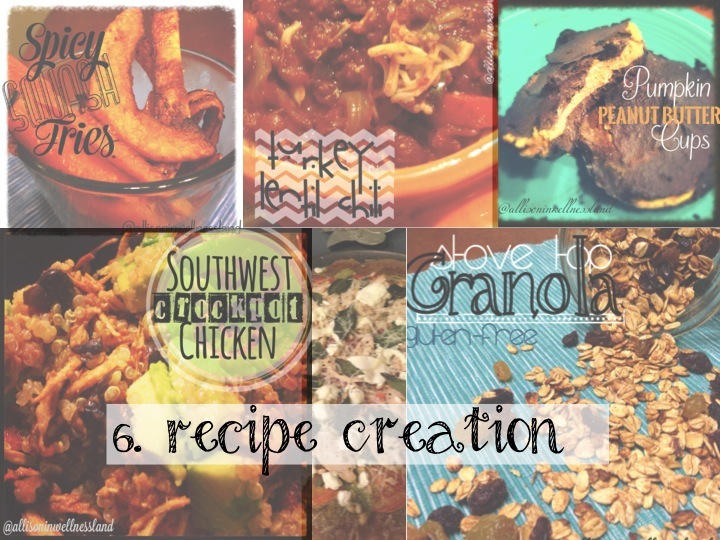 Lots of yummy food happened in 2013! 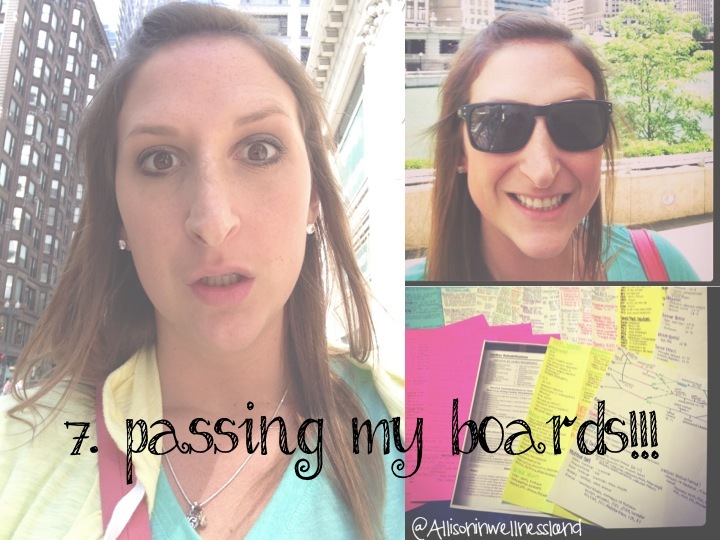 Post boards #selfie would’ve been on the attitude list if I hadn’t passed. Praise the Lord I was able to study and pass that bad boy! 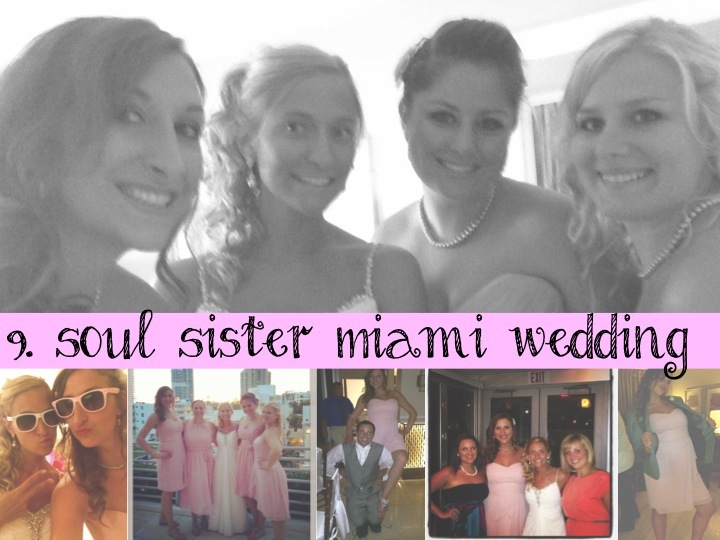 My soul sister got married & I got a vacation! Miami was a week of memories that will soon not be forgotten. Another beautiful couple who I was blessed to stand by while they celebrated their love. 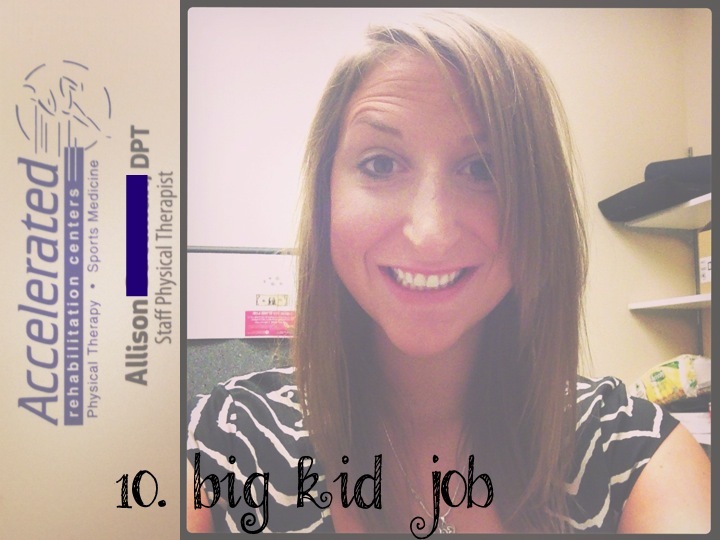 After YEARS of telling my dad (and anyone who’d listen) that I would be a PT when I grew up the day finally came where I put on my big girl shoes and started my FIRST JOB! Business cards make it extra official! 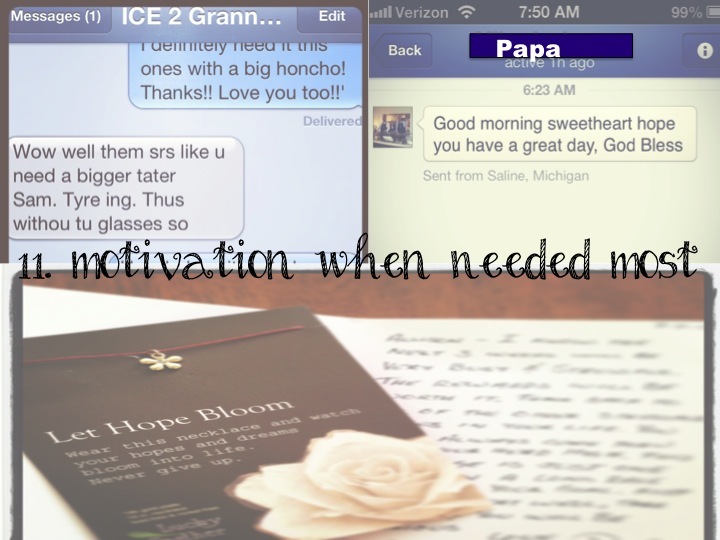 Motivation from loved ones is never lost on me! I love getting little notes from my family at random. They always seem to be at the MOST needed time! 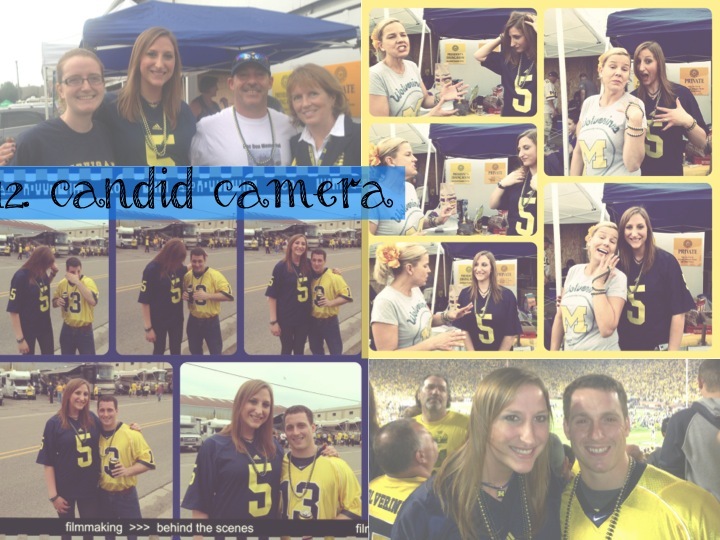 My Michigan football team may have let me down but at least I have wonderful memories from the game and these great CANDID shots to make me laugh each and every day! 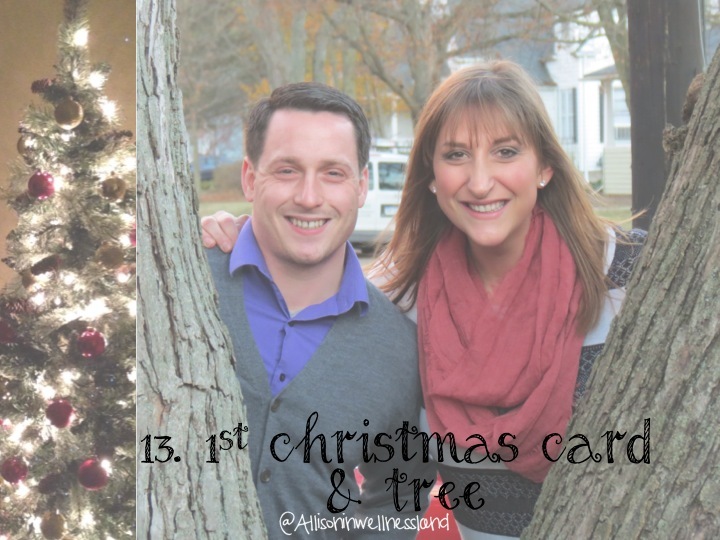 Brent & I are celebrating our 2nd Christmas together but this year is our first year where we decorated our own tree & sent out a christmas card!!! I love the holiday season and having an official tree & stockings makes me feel like a proper adult. Although this is just a part of them, I am beyond blessed with an abundance of loving and supporting family members. I cannot thank you all for the love you give me and the fun times and memories we share together. Y’all Rock! 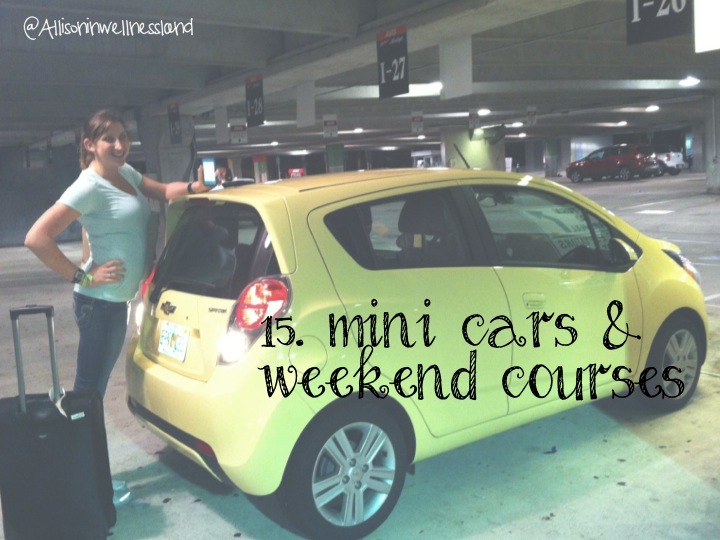 Because what 6′ tall girl doesn’t like a tiny smart car? 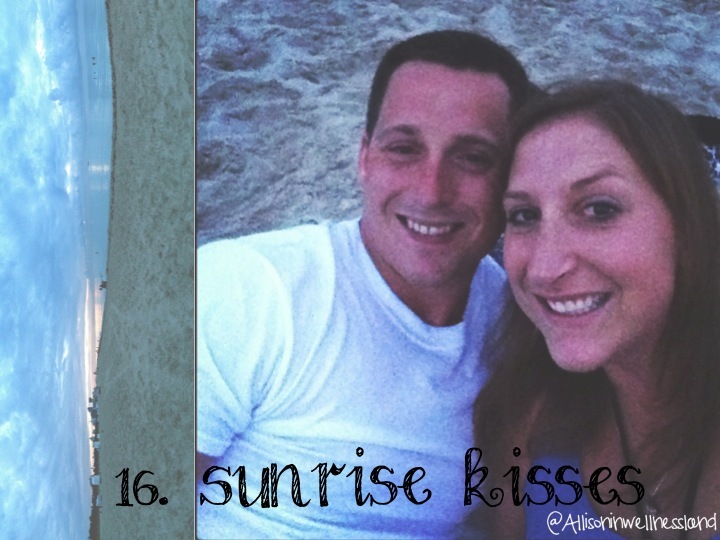 Ahhh sunrises on the beach with a kiss to top it off… nothing gets better than this! Living in Texas got the best of me and I brought the best of it back with me in the form of these beautiful boots. 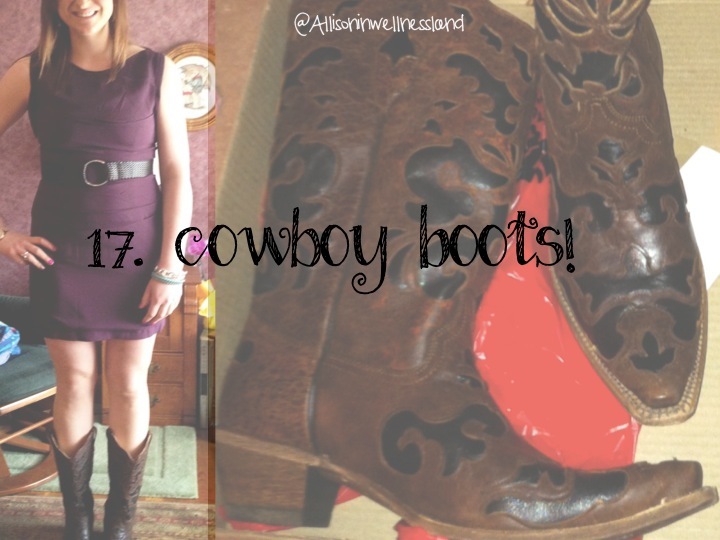 It’s amazing what a good pair of boots can do for a mood! My dad is one hellvua guy! I am grateful for all of his love, support and encouragement. I could not be where I am today without all this man has done for me and my family over the years! LOVE YOU! 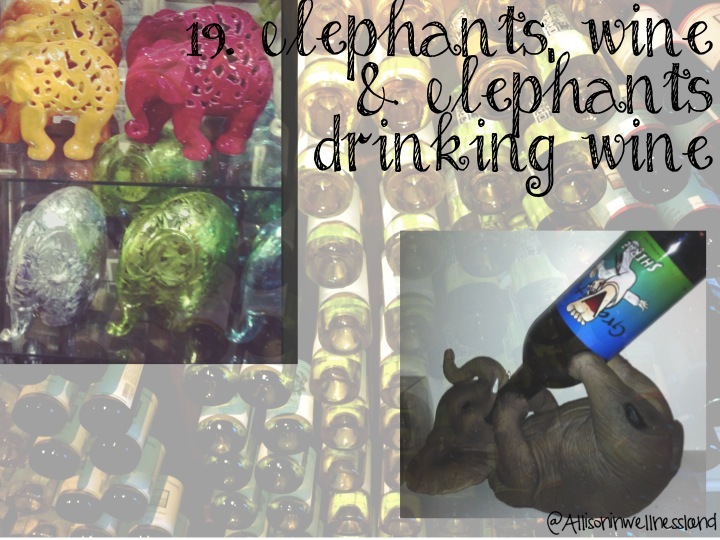 Its simple I love Elephants & I love Wine so whats better than an elephant drinking wine? and last but CERTAINLY not least YOU!!! 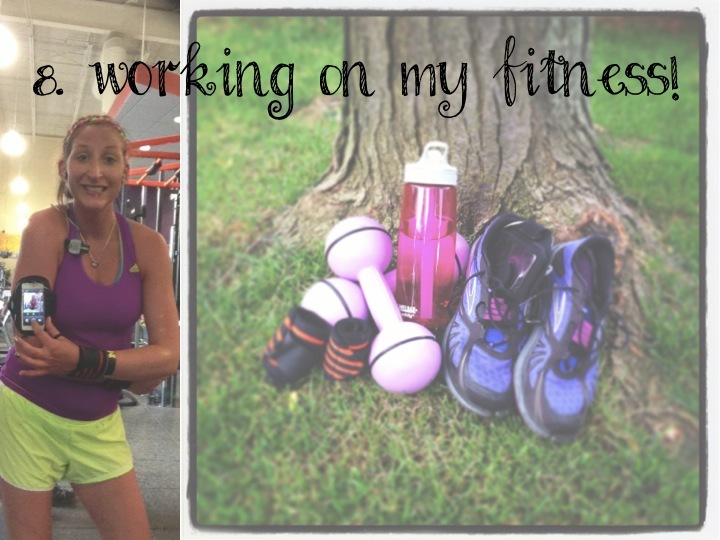 for without all of you this blog would just be me rambling on and on…. well lets be real I do that any ways and the few of you who are reading this are probably really bored with me by now… but THANK YOU for being my motivation, my encouragement and my inspiration. 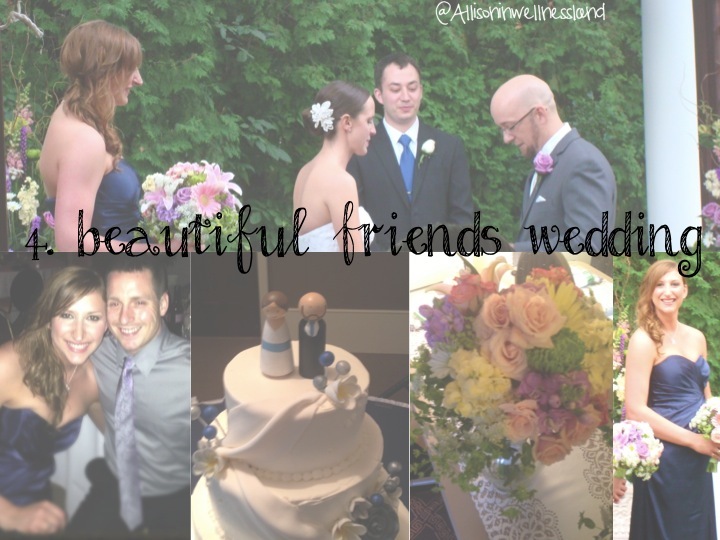 Without this blogging community I would be in a very different place than I am now. 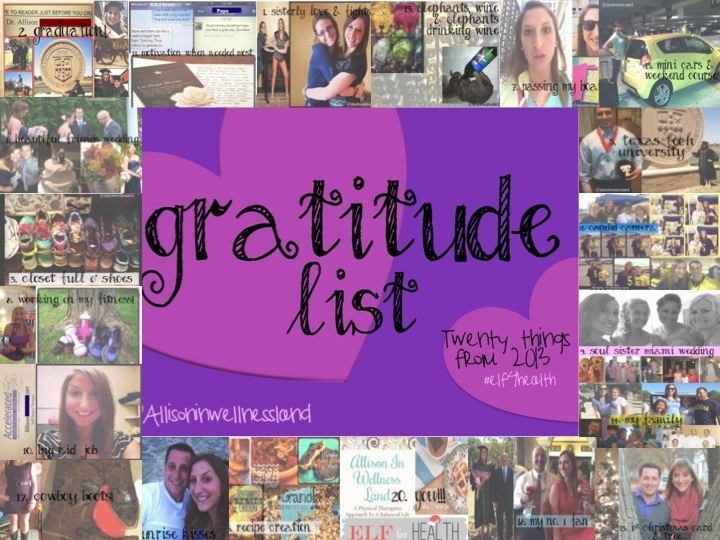 So there you have it Twenty Things From 2013 that I am grateful for. I hope you all have a wonderful week & take some time to think about what would be on your gratitude list. I’d Love To Know ~~ Whats on your gratitude list?